Only 55 VC Funds Raised Money In The Third Quarter (Down 29 Percent). From TechCrunch. This pretty much speaks for itself. The important note is that all of this happened before the last 3 weeks during which the dow has fallen ~ 3000 points. This is not about doom and gloom for startups – it is about understanding the environment you are operating in. The third quarter saw the number of U.S. venture funds raising new cash decline by 29 percent to 55 funds, according to data from the National Venture Capital Association and Thomson Reuters. 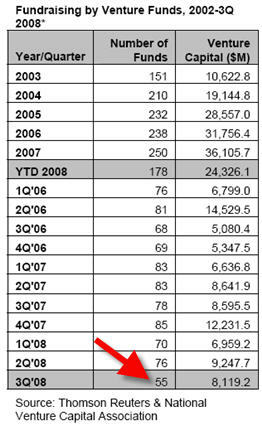 That compares to 78 new funds a year ago and 76 new funds in the second quarter of 2008. And 45 of that 55 were follow-on funds rather than new funds. Each of those funds, though, raised a lot more money on average. The total raised for the third quarter was $8.1 billion, down only 6 percent from the third quarter of 2007 (but down 12 percent from the $9.2 billion raised in the previous quarter of this year). And remember, all of this was before the financial meltdown of the past two weeks that had alarm bells ringing at every VC firm. The three largest funds in the quarter were Sequoia Capital’s $930 million late-stage fund, Austin Ventures’ $900 million balanced-stage fund, and InterWest Partners’ $650 million early-stage fund. In general, more money is going towards later stage, proven businesses than early stage financings. (More at VentureBeat).